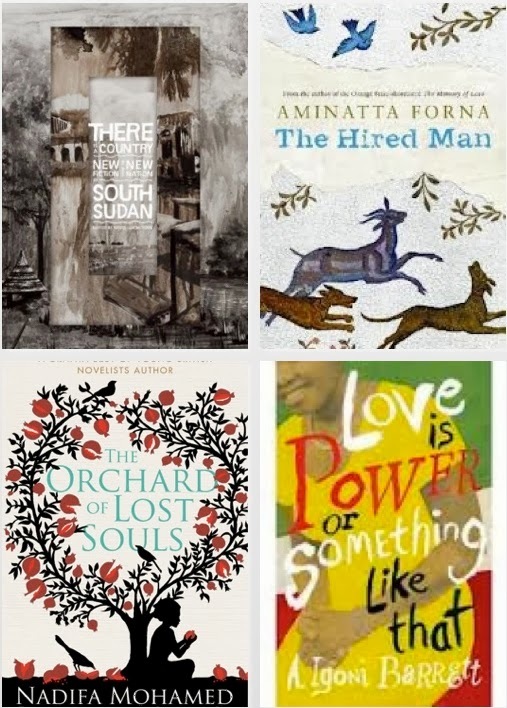 2013 has been another great year for African literature, and since my reading this year was pretty awful, I decided instead to look back at the year - new releases, festivals, awards and more. Enjoy!!! It seemed like every other week a new novel came out this year - The Hired Man by Aminatta Forna, The Shining Girls by Lauren Beukes, Americanah by Chimamanda Ngozi Adichie, Love is Power by A Igoni Barrett, Tomorrow I'll be Twenty by Alain Mabanckou and The Orchard of Lost Souls by Nadifa Mohamed to name some. 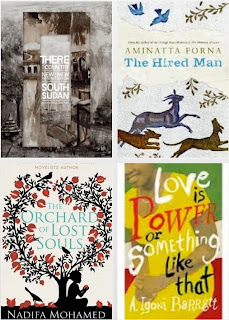 There was also a lot of firsts - There is a Country: New Fiction from the New Nation of South Sudan and debut novels from Taiye Selasi with Ghana Must Go and NoViolet Bulawayo with We Need New Names. In January, the International Prize for Arabic Fiction (the Arabic Booker) shortlist included Tunisian author Husein Al-Wad's His Excellency the Minister. In April, Granta Best Young British Novelist 2013 announced its list of the 20 best British novelists under 40. This was more diverse than usual with the authors coming from a wider range of ethnic backgrounds and women forming the majority of authors. Included on the list was Somali-born Nadifa Mohammed, Nigerian born Helen Oyeyemi and Taiye Selasi, born in London to Nigerian and Ghanian parents. Also in April, the Kenyan-born Somali poet Warsan Shire was announced as the first ever winner of the Brunel University African Poetry Prize. In May, E E Sule was announced as the African Regional Winner for the 2013 Commonwealth Book Prize for his novel Sterile Sky. In May, Marie NDaiye's Three Strong Women was longlisted for the Man Booker International Prize 2013. Also in May, Mozambican author Mia Couto was announced as the winner of the 2013 Camões Prize for Literature, one of the most prestigious international awards honouring the work of Portuguese language writers. In July Chimamanda Ngozi Adichie was awarded the 2013 Chicago Tribune Heartland Prize for Fiction for Americanah, which was described as 'a novel that engages with important ideas about race, and does so with style, wit and insight'. Also in July, Nigerian-American Tope Folarin won the 2013 Caine Prize for African Writing for his short story Miracle. In the same month, Uganda's Jennifer Nansubuga Makumni won the Kwani? Manuscript Project, a new one-off literary prize for unpublished fiction from African writers, for her novel The Kintu Saga. In September NoViolet Bulawayo's We Need New Names made it on to the Man Booker Prize 2013 Shortlist and The National Book Foundation's 5 Under 35 List. In November Mia Couto was announced as the laureate of the 2014 Neustadt International Prize for Literature. 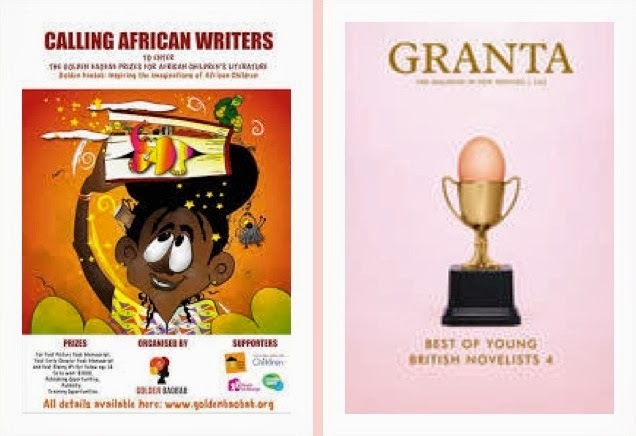 Also in November, the winners of the Golden Baobab Prizes for African Children's Literature were announced. Golden Baobab also launched their prize for illustrations. In December, the innaugural Etisalat Prize for African Literature announced its longlist including We Need New Names, Bomboy, Daughters Who Walk this Path and The Spider King's Daughter. In May, there was a huge contingent of African authors in Etonnants Voyageurs in France. 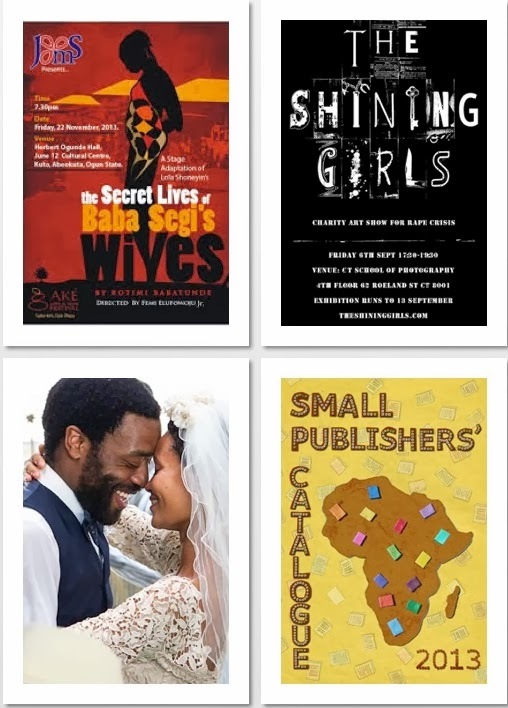 A couple of other events/festivals this year included the Royal African Society's literature and book festival in London in July and the inaugural Ake Arts and Book Festival in November, which also included the stage adaptation of The Secret Lives of Baba Segi's Wives by Lola Shoneyin. Cordite Books, a Pan-African Crime and Spy Fiction was launched this year. It was announced in March that the deadline for submissions for AfroSF Vol 2 will be March 2014, which means a second anthology will be coming our way in 2014. 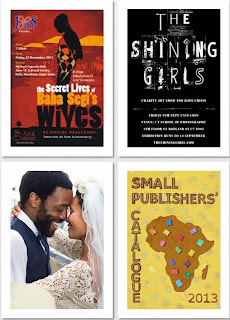 In May, the Small Publisher's Catalogue, Africa was published. Also in May The Shining Girls was acquired by MRC and Appian Way to be adapted for TV. In July an interview Chimamanda Ngozi Adichie did with Aaron Bady on Americanah and more led to some reactions from some of the Caine Prize Shortlistees on her views of the Caine Prize. In September Half of a Yellow Sun premiered at the Toronto International Film Festival. Also in September, Taiye Selasi opened the ilb 2103 festival with a speech 'African Literature Doesn't Exist'. There was also The Shining Girls Charity Art Show. In October, Volume 25 of Paradoxa Africa SF was published, which let us know that '[if] African sf has not arrived, it is certainly approaching fast'. Adichie really was everywhere this year - her TEDxEuston Talk 'We Should All Be Feminists' was sampled on Beyonce's Flawless. There was also some sad news this year. In March, Chinua Achebe passed away, while in September during the StoryMoja Hay Festival Kofi Awoonor died at the terrorist attack at the Westgate shopping mall in Nairobi. While there is probably a lot more I have missed and I know I haven't really included North African literature, it really has been another interesting year in African literature. With over a week to go before the year ends, I'm looking forward to what 2014 has in store.